The Seattle Go Center held a large tournament to celebrate their 20th anniversary on Saturday, Oct. 3. It was the largest fall tournament they have had in many years, with 48 players participating. The well organized TD’s, Bill Chiles and Dan Top, kept the event on schedule despite the large crowd. The players were smoothly distributed in terms of strength, so that most of the handicapped games used small handicaps. (88% of the handicapped games used two stones or less.) The next day, Kuma Sensei 6P from the Nihon Ki-in gave a lecture reviewing tournament games. The Open Section had 8 players and was won by longtime Northwest champion Edward Kim 7d. Edward bested Chanseok Oh, Jeremiah Donley, and Peter Nelson in his three games. Peter Nelson placed 2nd in the Open Section. Chris Kirschner won all his games in the Dan Handicapped Section, winning that section. Chris is one of the founders of the Go Center, and one of its most active volunteers. Ben Hakala placed 2nd. Jung Doo Nam won the Single Digit Kyu Player Handicapped Section, with David Snow placing second. Mark Richardson won the Double Digit Kyu Player Handicapped Section, with Lucy Wang placing second. 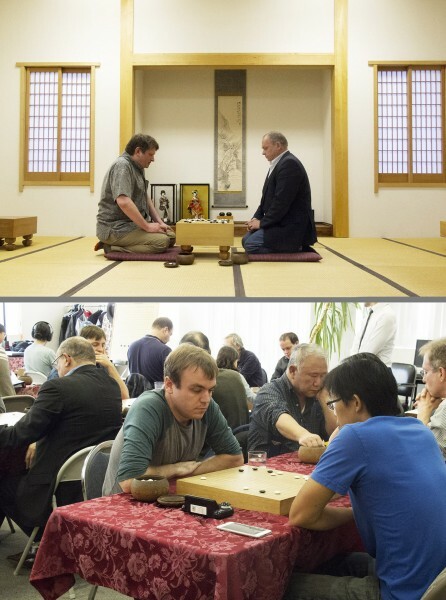 Photo Captions: (Top) Andy Okun, President of the AGA, playing Harry van der Krogt of the European Go Cultural Center in a friendly game in the tatami room of the Seattle Go Center. (Bottom) First round of the tournament. Photos and report by Brian Allen.